Home / Advice / Ceiling Fan Advice / What Color Ceiling Fan Should You Buy? As Laurie and Hildy went about uprooting clunky, wobbly ceiling fans from homes in ‘Trending Spaces’, little did we know that the fixture was being falsely maligned for being an eyesore. Cut to today, ceiling fans are fast becoming the norm in homes all over the world for saving energy and allowing better air circulation. 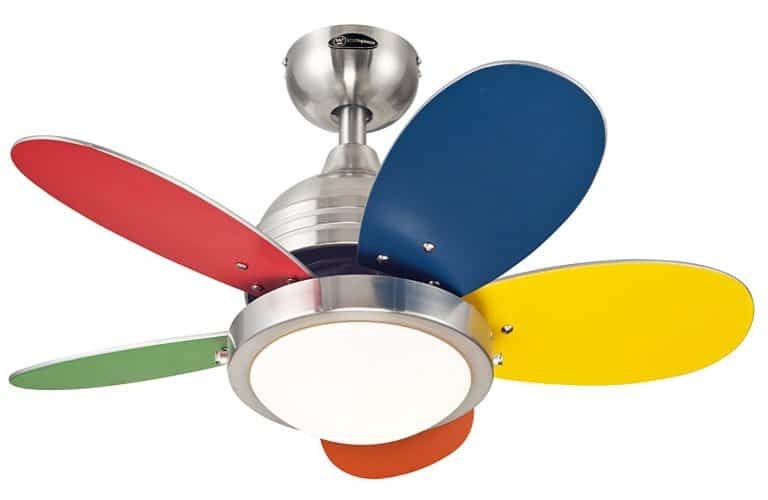 The only conundrum that still haunts a homeowner is what color ceiling fan to pick. There are the eternal whites that seamlessly melt away into a ceiling exuding a vibe of coherence. But in a contemporary décor setup, whites seem a tad tepid, especially if the canvas is peppered with enough color pops in terms of accessories. How then, do you narrow down on the right color for your ceiling fan that perfectly complements the décor? While selecting between blends and contrasts, boils down to personal preferences, most designers these days prefer to go against the grain. That means, contrast edges ahead of whites, albeit slightly. Don’t get us wrong here. White still works great, especially if the whole canvas is white or close to it. But even then, adding some contrast, especially when there’s a whole bunch of colors, finishes and styles to pick from, is a great way to create a functional fixture that doubles up as an accent piece/ focal point. Moreover, contrasting ceiling fans can be clubbed with art pieces, the wooden floor, the bed frame, the windows or just about anything that catches your fancy. You have a lot more options if you prefer to choose a contrasting ceiling fan. Ceiling fan design has undergone a renaissance in the recent past. Colors like Bronze (currently trending), brushed nickel, black, brass, dark gray, polished silver, aluminum, tan gold and rust dominate the palate and you have hundreds of finishes in each of these options. Matching the blade color with the color of the wood that’s predominant in the room is a great way to blend with the existing décor theme. For example, if the upholstered furniture, the wooden floor and the molding flanking the fireplace are all cherry-stained wood, cherry colored fan blades against a white ceiling will open the canvas offering enough contrast to keep things interesting. Similarly, you can also match it with the metallic hardware/accessories used in the room. This takes the guesswork out of it. You don’t have to rack your brains trying to figure out what color ceiling fan with gray walls or what color ceiling fan with white ceiling. One of the ways to prevent the décor from looking mundane in the entire house is to mix and match things up. You can always go for the more basic/blend options in the bedrooms so that it stays subtle and does not seem overwhelming. On the other hand, the outdoor areas can use some color. A black fan blade and body against a white ceiling is a recent trend that finds many takers. However, there needs to be a hint of black somewhere in the décor for this to work. If you are like us, then you’d hate making frequent design changes. So, do your research, consider your options and narrow down upon the right ceiling fan color.